Bluetooth What You Will Learn Nowhere Else – Is It Really Dangerous? Cordless Phone Radiation: Cordless Phones Even More Dangerous Than Cell Phones? It’s a dark night in August 2016. The rain is coming down hard outside. I am carrying my son, pacing as I try to help him sleep (he is having trouble breathing) and my husband is sitting next to our daughter who is trying to sleep on the couch. It’s way past midnight. It’s been a tough year health wise. My husband, two kids (aged 3 and 7) and myself have all just barely recovered from a second round of the flu in the same year. We all had the flu earlier in March of this year followed by strep, ear infections, and several viruses, and now again a second time (in barely 6 months) the flu again. We were baffled as our nutrition and diet and lifestyle have been better than ever before – eating only organic, plant-based, nutrient-dense foods, juicing, smoothies and the works. We have all also been struggling with repeated breathing issues, wheezing and allergies; we have never had such health problems. We had just returned from spending summer overseas – surprisingly our health there was fine. Even though we weren’t always able to eat healthy while travelling we had no health concerns, no breathing trouble. Just as we returned home after an enjoyable summer we were hit hard by the flu a second time in the same year! It all made sense today. I had the idea of checking our home for geopathic stress. I was shocked at what I found. I had checked again and again at several different times of the day and sure enough the whole house was covered with very strong geopathic stress fields. We are in shock. I have done research for many years on geopathic stress and am fully aware of the severe health issues caused by it. To think there is so much stress in my own home. I am in even more disbelief as up until now I just know how to detect it, I have no clue on how to fix it or remedy it. My solution up to this point has been to move the bed. But now with every square inch of the house covered in such strong fields where am I going to move the bed? This certainly explains the health issues my children and both my husband and I are experiencing. 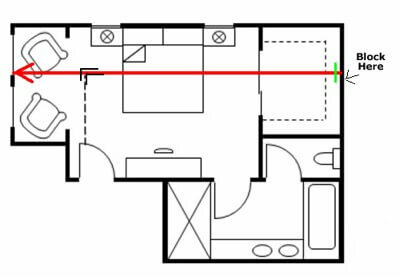 We find a section of the house that has the least geopathic stress fields – which was our family room. We set up temporary sheets on the hard cold tile floor on a small rug and help our kids sleep there. What do we do next? How do we fix this? All we want is for our kids to be healthy. The entire night is spent in fear and confusion, wondering what to do next. In early 2004 while learning the science of Sthapatya Veda from an architect I first heard him mention geopathic stress. I also watched his videos showing him holding two rods and walking. Somehow he just knew where the stress was and placed a copper wire down. He then claimed that it is fixed. Personally, I found this too ‘out there’ and unscientific for my logically trained engineer mind. I would much rather prefer a scientific instrument that I could use to measure and actually see the readings. Nonetheless, I did a lot of research and found that there is something to this geopathic stress. Study after study showed links to cancer, to autism, behavioral problems and much more. So, convinced that there is something to geopathic stress I got some plain copper wires from a hardware store. I tried to walk like the architect showed and found that the rods did move at some spots in my house. I repeated it at several places and amazingly, was able to see the wires move in certain spots and on each pass they are in a similar area. I had my husband try. At first his rods didn’t move at all, but after a few minutes of calming down and trying a few more times, he too was able to see the areas where the copper wires moved. I tried to place copper rods down like the architect had shown in his videos, but I can still see that the fields are there; meaning I couldn’t really fix anything. I was, however, able to figure out that there is something like a field present at a given spot. No worries, I thought. All I need to do is figure out the spots/zone and make sure the bed or the main seating area is not on one of those spots. So life goes on. We move to a bigger house a few years later. As we are moving furniture into the new home I quickly use some copper rods, find the major areas where they move (to find geopathic zones) and am sure to place beds and sofas away from those areas. It’s summer and our area had hardly seen much rain for the last 5-6 years. We had a daughter in 2008. As new parents we are adjusting to this new bundle of joy. We have countless sleepless night. As our daughter grows she refuses to sleep on the bed. We work very hard to get her to sleep and the moment we place her down she is awake. For 3 years, we spend every night holding her and sleeping on a rocking chair. She also develops eczema and sometimes has crazy nightmares. At the time we don’t think anything of it. We are very careful on the nutrition and food. Our diet is high in nutrient-dense and organic foods. So while there, the eczema is in control with no medications. Soon we have a second child – a son. We have a similar experience with him. We put it off saying that it’s just our children. What Next? How Do We Protect Ourselves? We have had a difficult year health wise; have just discovered that our whole house is covered in strong geopathic stress fields. Having done on and off research on geopathic stress fields for over 10 years I know full well the seriously damaging health effects of it. During this time I also realized (after much research and looking up local Watershed and FEMA maps) that a large underground river flows right below our property. For several years this area had not had enough rainfall but in the last 3 – 5 years we had torrential rains causing this underground river to fill up to full volume. This river was probably dry when we first moved in and when I tried to find geopathic stress just found a few lines. Now after the rains this river was full and flowing which was causing such severe geopathic stress. Not just that, I also learned that this area has clay soil, so it retains water. Meaning a whole lot of homes in this area will have strong geopathic fields – which explained why so many friends and neighbors were struggling with severe health concerns. What Is Geopathic Stress? And Why Should You Care? We are surrounded by natural frequencies called the Schumann Resonances. As human beings our bodies and minds are designed to be surrounded by this natural frequency and we function best when surrounded by these. Schumann Resonances (SR) falls within the range of (alpha) human brainwaves. When our brains are in Alpha state, we have better memory, learning, and concentration. Our stress levels are greatly reduced. Scientific studies have shown that these frequencies are an essential requirement for physical and psychological health. Laboratory research has also shown that when living cells are exposed to Schumann Resonances, their immune protection is increased. 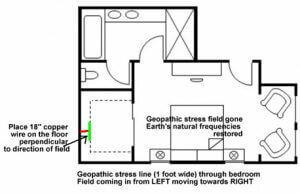 When these natural surrounding frequencies are distorted, what results are geopathic stress zones – “Geo” meaning Earth and “pathic” meaning gone bad. Earth’s natural radiation can be distorted by both natural and man-made influences like those found in all of our homes and offices today. 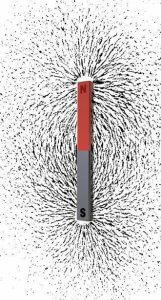 These distorted radiations (geopathic stress) affect the earth’s natural and life-supporting magnetic field. The resulting distorted fields affect our physiology and long term exposure results in chronic illness. In today’s world all homes have geopathic stress zones. Dr. Otto Bergsmann, University of Vienna, shared the results of his study (close to 7000 individual tests) done in conjunction with a team of distinguished professors, doctors, engineers, scientists, and dowsers. They found that just a 10 minute exposure to such a geopathic stressed environment caused a change in the serum values of Serotonin, Zinc, and Calcium. Many other altered states to biological functions were also noted. The United States Environmental Protection Agency after studying 15 years of data discovered a positive association between geopathic stress and cancers. Children in particular are both extremely sensitive and instinctively avoid geopathic stress zones. 3. 92% of all cancer patients have been sleeping in geopathically stressed zones (Dr. Hans Napier, Cancer Specialist). 4. In many cases where children have been diagnosed with autism, the mother has been sleeping on a geopathic stressed zone during pregnancy (Rolf Gordon). 5. Radiation accumulates where geopathic stress lines are crossed (Dr. Ernst Hartmann, Germany). 6. Exposure/sleeping/working on geopathic stress causes a weakening of the immune system leading to serious illnesses. 8. Bees and wasps love these lines. Cats love to sleep on these lines. In fact a cat’s favorite sleeping spot is usually on a geopathic stress line. If that’s your bed, then you need to be sleeping somewhere else! 9. Dogs, cows, horses avoid them. 10. Cracks in cement, homes, and floor boards develop along the line. Clutter usually builds up through the space along the geopathic stress. 11. Geopathic stress reaches its maximum between 2 and 3 am at night, especially on full moon nights, and also just before a storm (Geopathology). 12. Most plants will not grow well when on a stress lines. Trees grow at strange angles; some also develop growths on their tree trunks. Evergreens, Holly, Pines, and Creepers love these lines and will grow very quickly on them. Geopathic Stress is an electromagnetic field (just like the electromagnetic fields of the sun’s spectrum). It has a center line and a direction. It’s typically 1 foot wide. The stress field is the strongest along the center line. Also referred to as geopathic stress lines. 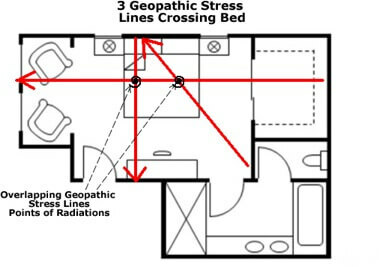 A typical home will have multiple geopathic stress lines as shown in the image. The majority are due to man-made causes. 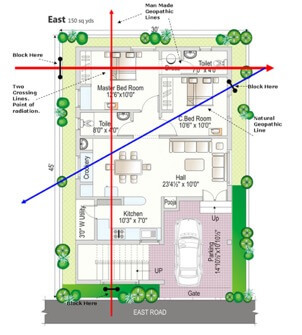 Many homes will also have geopathic stress lines caused by underground streams and water. In many places if the soil holds water (like clay soil or river basin soil), it is common to have multiple geopathic stress lines caused by the water. It is also possible that some homes have underground water held in the soil only during certain months of the year (during the spring and fall typically when it rains a lot). People living in such homes will notice a drop in their immunity levels during the rainy months facing more health challenges during those months. When there is underground water, the man-made geopathic stress lines then overlap completely with the geopathic stress lines caused by the underground water and become radiation lines instead of just radiation points. Geopathic stress zones occur when the earth’s natural frequencies (Schumann Resonances) are disrupted. 3. Place a copper wire down in the path of the field. From the point of placement of the copper wire, the earth’s natural frequencies are restored. So if the direction of the field is from LEFT going to the RIGHT as above, the geopathic field exists on the left, once the field hits the wire in its path, going forward to the right, the geopathic line is no longer there. To the right of the wire earth’s natural frequencies are restored back to normal. 4. 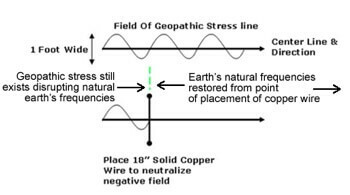 Geopathic stress is neutralized and the earth’s natural frequencies are restored for several 100 feet from the point of placement of the copper wire. In this home the geopathic stress would be felt in that one foot wide line through this bedroom and on any levels or floors in this home above this bedroom directly. 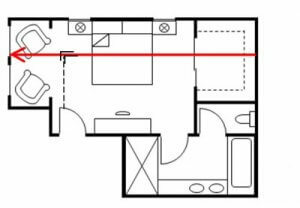 So for example, if there is a game room or a loft right above this bedroom, that loft would also have a geopathic stress line through it at the exact same location. The field is moving from the LEFT to the RIGHT. You need to tape or find a way to fix this on the floor so that it does not move from that spot. You can use any regular tape and perhaps cover the wire with a rug so it’s not in the way. This will fix the geopathic stress in the bedroom and earth’s natural life supporting frequencies are restored in the bedroom. Now doing this will also fix the geopathic stress on any levels above this bedroom. So just this one wire will also restore earth’s natural frequencies in the loft above. You DO NOT need to go up there and fix the loft again. 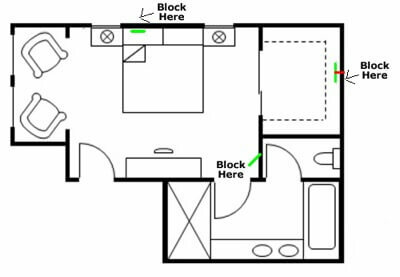 Whenever you detect geopathic stress in a home, you would go to the lowest level in the home that the stress is detectable at and block the field at that level. That way all the levels above also get neutralized. I knew in my heart there must be someway to fix this. I saw the architect do it (in early 2004) and there are others showing it on online videos but I am just not able to understand how they did it. Each night, I help the kids sleep on the floor in the family room. I work for hours every night trying to fix the stress lines. I try and experiment and experiment for a whole month and slowly observe that the rods have a very specific behavior. Carefully, I note and observe the behavior. From the movement of the wires I begin to notice patterns. More experimenting and I discover how the wires move with respect to the direction of the field. With careful observation I also notice slight changes in the wires’ behavior between geopathic stress fields and negative grids. Finally after weeks of experimenting and trial and error I figure out how to place a copper wire on the floor (and fix it there). I notice that this clears the geopathic stress fields. I am able to fix several of the stress lines. I have just managed to make the family room area safe. We all have been sleeping on the family room floor and begin to notice health improvements. Below I share step by step, how to detect geopathic stress lines and also how to use a copper wire to block/neutralize the stress so as to restore earths natural life supporting frequencies. We will use simple L dowsing rods. L rods are easily available online. Be sure to get rods that have the tubes as handles. They are usually available in copper or brass. How Do These L Rods Work? When iron fillings are placed around a magnet, they follow the magnetic fields surrounding the magnet making them “visible” to us. In this same way rods/wires that are good conductors of electricity move to follow the electromagnetic fields of a geopathic stress line. Since the center line is the strongest, the wires/rods will try to line up with the center line. If the rods are anywhere in the field of the geopathic stress they will move and try to align with the center. 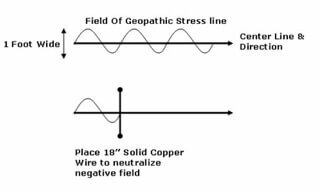 Geopathic Stress lines can be easily neutralized by using some solid copper wire (a minimum 8 gauge thickness wire is recommended) as shown in the image. When a solid copper wire is placed perpendicular (approximately 90 degrees to the center line) the geopathic stress line gets blocked. 5. Wait to see if the rods move. When you are walking perpendicular to a geopathic stress line. 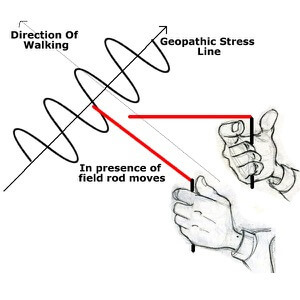 If you are anywhere in the field of a geopathic stress line, the rods/wires will move. When you are close (a few inches off) the center line, the wires will cross. 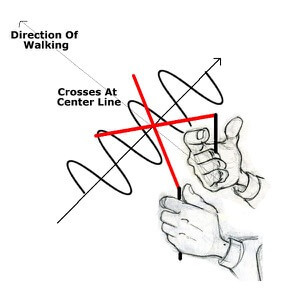 The rods will make a perfect cross (90 degree angle) when you are walking perpendicular to a geopathic stress line and are just a few inches off the center line as shown in the image. 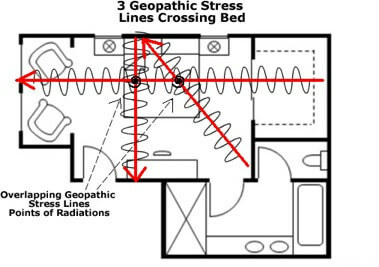 Here is a bedroom that has 3 geopathic stress lines crossing the bed (See Images). 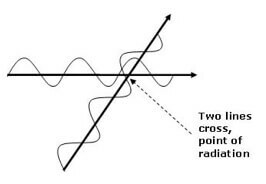 There are two points of overlapping geopathic stress lines which are points of radiation. To check this bedroom for geopathic stress lines, begin at the door and walk straight towards the back wall as shown in the image. 6. The rods will cross when you are just off the center line. 8. 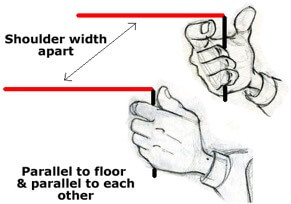 Hold the rods facing forward and parallel to the floor and each other. 9. Both the rods will turn towards the right, indicating the direction the geopathic stress field is coming from. The rods always get pulled towards the direction the field is coming FROM. 10. Walk to the right as far as you can get and place a copper rod 18″ long perpendicular to the center line. 11. First continue checking for any more stress lines until you reach the wall. 12. Walk back a second time and check, If you have blocked the stress line correctly as shown, the L rods should not move or detect the field this time. 14. You should be able to detect the line coming straight down through the bed. Locate the direction and block it with a copper rod perpendicular to the centerline towards the head of the bed. 15. Continue to check and you should detect the diagonal stress line. The L rods will make a cross less than 90 degrees with the left rod being closer to the center line, so gently turn your angle of walking a few degrees until you are able to get the L rods to be approximately 90 degrees. 16. Now detect the direction and block near the bathroom wall. 17. Turn to the left and continue checking the rest of the room, you shouldn’t see any more lines. All lines are blocked. We notice immediate health improvements – to begin with no more disturbed sleep at night. The kids sleep soundly without nightmares and without waking up through the night. The allergies my husband and I have been having are gone. No more eczema, no more skin issues, stress levels seem to have reduced. No more breathing issues at night. Our immunity is back up and we have fewer colds and viral infections. As I figured this out I began to help friends who too were struggling with severe health challenges due to the strong geopathic stress. They began to notice health improvements. Friends who had been bedridden with back problems were able to get back to their normal life. Friends with cancer moved their beds and began showing improvement on their cancer treatments. People who had kids with allergies and asthma began to show improvements. Others with repeated migraines had fewer severe migraine episodes. It’s Your Turn. 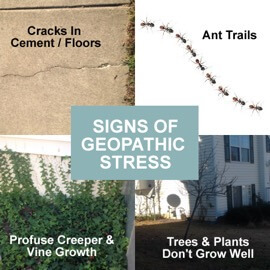 Check Your Home For Geopathic Stress Fields Today. Take a moment today and get yourself some L dowsing Rods. They cost under US $20 or you can easily make your own for under US $5. We need to take action to protect ourselves, our loved ones and raise awareness. Instead of living in fear of the new radiation filled environment, let’s focus on the many solutions we have available to make our homes/work spaces the nurturing and safe havens they are meant to be. 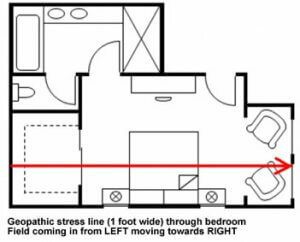 Comment below and let me know the one area in your home where you found geopathic stress lines. Sincere thanks and gratitude to Monica Verma Vachery for this guest post. Author Bio: Monica Verma Vachery has a BE Electronics & Telecommunications, an MS in Computer Science and an MBA from NC State University. She is also qualified in Vedic Green Building & Vastu Architecture and is a passionate student, observing, researching, applying, & helping people for over 15 years now. The subjects of subtle energy and a holistic lifestyle are what interest her most. Over the years her fascination with how it all works has only grown. Healing Sick Houses, Dowsing for Healthy Homes, Roy and Ann Procter, Gateway, 2000. Geopathic Stress and Subtle Energies, Jane Thurnell-Read, www.lifeworkpotential.com , 2006. Ancient Energies of the Earth, David Cowan and Ann Silk, Thorsons 1999. Energy Dowsing for Everyone, Patrick MacManaway, Southwater, 2004. Interesting geopathic stress details from a long-respected British dowser. A good selection of European geobiology research to be found on the web, and some interesting case histories. It is wonderful to see the topic of geopathic stress being given attention, as it is a very important one. Many studies have indeed shown a correlation between health problems such as cancer and geopathic stress. Studies have even been done showing that if you stand in a zone of GS for as little as 15 minutes, certain values measurably change for the worse, like serotonin level, etc. It is wonderful to see this important health topic getting some wider attention, but what is disturbing to me is that most of the people who are promoting it are using very old data and old ways of thinking, and sometimes saying things that aren’t actually true. Many people will tell you that you cannot change the energies of a place. It is far more complex a subject than yes or no. I am glad to see this presenter has a more enlightened view than ‘move to a new house.’ So, that much is great. What disturbs me is that like so many others who have taken up the banner of geopathic stress, this presenter is talking about dowsing–though not naming it as such–and shows ignorance of what dowsing is. She is not helping promote this topic by saying L-rods find geopathic stress, as if they are magic wands that operate on their own to find it. She is also incorrect that rods have anything to do with changing the energies of a place. Dowsing is a way of focusing your intuition to get answers to questions your brain cannot answer. A tool does not need to be used, but when it is, all it does is amplify your body’s response to your question. Without a clear focus, without being in a dowsing state and without intention, your answers will be inconsistent and unreliable. My husband and I have been teaching dowsing for 20 years and offer much free training on our website. We also have been doing space clearing for that long. It is vital that those who wish to promote space clearing make sure they don’t fall into the mistake of promoting dowsing for finding energies as if it is some kind of magic. You can find geopathic stress without any kind of tool and even using a diagram of a place far away, you can determine the energies. We’ve made a living doing just that. The tool is simply an indicator of your intention and focused desire to intuitively discover what the energies are. Without your focused intention, the rods do nothing. L-rods can be used to find lost objects, underground pipes, geopathic stress, water and much more, but what matters most is what you decide you are searching for. Clearly, just pointing them and wandering around is a prescription for confusion and false answers. It is vital that the practitioner focus on exactly what they want to find in a specific way for best results. It must be made clear as well that dowsing is a SKILL, not a psychic magic trick. If you want to be good at it, you need to practice technique. You don’t just pick up rods and wander around; it’s easy to promote that belief when no one can prove whether findings are right or wrong, which is the case here. Who’s able to argue what you discover is true or not? That is why we must be careful with technique and how we portray dowsing. Lastly, it is terribly wrong to tell anyone that a rod or pendulum or anything like it is doing clearing for you. That is bunk. Your focused intention is what matters. You can anchor it using whatever you like: color, a symbol, a fragrance, a sound, or something even weirder like a number or feather. The confusion in dowsing today that the tool does anything is very sad, because it makes dowsing look ridiculous. Tools are not even required in dowsing or clearing, so it makes no sense to give them that role. It is a short cut that leads to false answers, unfulfilled beliefs and discouragement. I applaud you for spreading the word about geopathic stress and dowsing, but I hope people can somehow stop going in the wrong direction about what dowsing is and what it does. I welcome anyone who wants to learn about how to dowse well to visit our free website, http://discoveringdowsing.com. Proper technique will help you get the desired results in space clearing. How do you know if the dowsing rods don’t pick up on hartman/curry lines… Maybe they are called leylines in English? Love your article BTW, I might have missed some info kids gave me a hard time. Well, when one is dowsing energy, that’s the problem, isn’t it? If you are using dowsing and have no other way to confirm your dowsing answers, then it’s all a matter of faith. 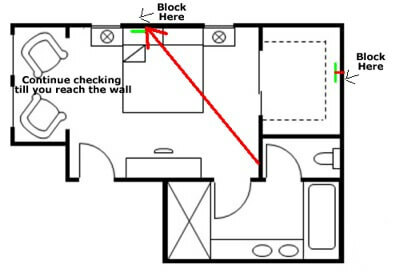 When working with clients, mostly long distance, we could get confirmation by asking them about areas of their home or property where we found something, but in general, dowsing energies gives you no real guarantees of accuracy, which is why you must be an accurate, masterful dowser. Patrick MacManaway, an expert in earth energies and dowsing, urges all dowsers to spend at least 80% of their time dowsing what he calls ‘tangible targets’. That doesn’t mean card suits and coin tosses; it means dowsing things you need and want to know that your rational mind cannot answer, but you can later confirm. Our ebook “101 Amazing Things You Can Do With Dowsing” by Maggie and Nigel Percy gives you plenty of everyday dowsing ideas. It’s getting it RIGHT that helps you gain confidence, and getting it WRONG can teach you a lot, as well. But if you don’t know if you are right or wrong, then how do you master dowsing and energy clearing? You can’t get feedback when dowsing energies as a rule. You go on faith. My husband and I dowse a lot, but we dowse about things besides energy and other intangibles. In our areas of expertise, we have mastered dowsing, and working with clients in space clearing for two decades and getting feedback from them has confirmed our results. But anyone who is using dowsing needs to master technique and practice it to gain accuracy. It is NOT always right for anyone. Even us. There are many things that contribute to geopathic stress other than lines of negative energy, whatever name you wish to call them. There are fault lines, vortices of noxious energy, spots of negative energy. And many others. And earth energies are only ONE type of noxious environmental energy. In addition to geopathic stress, there are manmade energies like curses and EMFs, plus cosmic energies of various kinds that are noxious. Space clearing and environmental energies is a complex topic, and I admit I get offended (and maybe should not) when people take a view that is not only incomplete, but faulty in how it presents dowsing and energy clearing. Space clearing is a very important topic. We’ve written two books on it and used to offer a course. We have decades of experience dowsing for environmental energies and clearing them. I am gratified to see more interest in this topic, but I wish dowsing were portrayed accurately and that environmental energies were not reduced to negative lines and geopathic stress. There is so much more. I’m concerned about the location of the electric meter outside of the bedroom in the house we recently purchased. What steps would you recommend we take to make that room a safe place to sleep? Thank you for this generously reseearched, philanthropic and informative article–I really enjoyed it. This is a certainly a subject that it is easy to be confused and mis-informed about…it has an air of mystery about it–and certainly a lost art for most people. I still am not clear after reading the article, or the comment from a professional douser that follows, about actual ways to make a space “clear” or healthy. I found geopathic stress lines under almost my full house…leaving no where else to sleep or hang out…I have hired dousers to check (both in person and at a distance and both found same thing). Yet when it came to shifting the effects and solutions…they tried both remote (which felt like it may have been a total snow job) and in person solutions (with re-bar poles in earth). Nothing has really worked yet. They said both, this may work and also it’s complete (the pro douser who works remotely said that two different times). I then continued to have pathological symptoms (extreme headaches, flu symptoms, depression, memory loss, sleep issues, etc) and a strong impulse and need to avoid being in the house. I have been staying at friends places for the past month since my symptoms got so acute. I look forward to trying the copper wire method you describe here…we shall see what happens. Can you say where/how you came up with that idea? Did you learn/read somewhere in particular about copper wire? Otherwise, I may sadly need to live elsewhere. Anyone with other (inexpensive and real) solutions/options/ideas…I welcome your comments! Thanks again for the article! I am working on the geopathic stress on my property. I have a quartz seam running under the house. It is difficult to move the bed. This seems more than the normal fault line as quartz magnifies any radiation coming in too I have found. I have also discovered it can flex with certain weather and can give off 10,000-100,000 v/m. Is there a cure for this? Thankyou! I live on the first floor of an apartment with an underground garage below me. 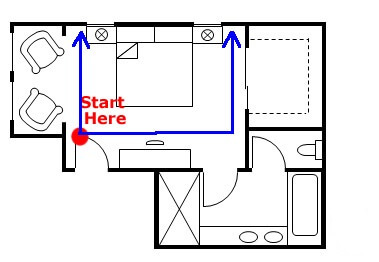 Will a copper wire help in my apartment? I can’t put a wire in the garage. flying back from Europe you were being microwaved in airports and aircraft the whole time= compromised immune systems from cells damaged. an additional reason for your falling ill. tell airlines to stop cooking us. I’ve been told by a professional ND to put straw beach mats under my bed for geopathic stress. Do they help at all? Thank you so much for reading through the article and beautifully explaining dowsing. Yes there is no replacement for the experience and skill of a dowser. They are truly a gift. I too am a dowser and have been for a few years. The area that we live in has so much underground water that causes a lot of geopathic stress, combined with stresses caused by man-made causes. I was called to check the house of someone whose child aged 11 was battling for life with cancer that was spreading. And yes of course there was a lot of water under their house and the particular bedroom where that child was sleeping had so many layers of stress (way more than the rest of the house). We tried every which way to reduce geopathic stress and we succeeded in fixing the child’s room. We fixed the house while the child was in the hospital. The child never made it home. He lost the battle to cancer. This just broke my heart. I too have little children and was devasted for weeks. After that I worked very hard here locally to raise awareness about geopathic stress and teach people how to dowse. I have taught 100s of people in live workshops. The moment I mentioned the word dowsing most people would develop a mental block and either not be able to dowse or just refuse to pick up rods. I didn’t get anywhere. I couldn’t get that child’s image out of my mind. So during this one workshop of live geopathic stress training I decided to give the rods to people and NOT use the word dowsing and just to observe and see what would happen. Almost everyone present was able to detect the stress lines. And what is more the rods followed a very specific pattern that was the same for everyone of them. 2. Yes everybody may not be a dowser or may not even have access to an experienced dowser,but my objective is to empower everyone with just a basic way to identify where the stress lines are. At the very least they may be able to move their bed. Just like the parents of that child we could not save might have done. True there is no replacement for the skill, experience, and insight of a dowser. And yes an experienced dowser can also gain a lot more information through the beautiful art of dowsing. Using the copper rods is not a magic trick and is just a tool that works to identify the fields. The dowsing rods DO NOT fix the stress nor do they clear anything. Again, I sincerely thank you for bringing light to the beautiful skill that is dowsing. Comments are welcome. Before you post a comment please read these guidelines. Copyright © ElectricSense.com 2009 - 2019. All rights reserved. ​Overcome EMF problems from cell phones, ​WiFi, smart meters, and a whole host of devices which make our lives simpler…at a price! ​Do this one simple tip tonight and if you don’t get the best sleep you’ve had in month’s tonight email me immediately! Sign Up Below... and Get Instant Access ​NOW! ​You will also receive my free emails packed with EMF protection tips. Unsubscribe at any time.